ATHENS, Greece -- AC Milan beat Liverpool 2-1 with two goals from Filippo Inzaghi to win the European Cup for the seventh time on Wednesday and avenge their defeat by Liverpool on penalties in the final two years ago. Liverpool, who looked down and out, pulled a goal back in the 89th minute through a Dirk Kuyt header but could not repeat their famous Istanbul fight back when they recoverd from 3-0 down to force a 3-3 draw and win the 2005 final on penalties. The Italians took the lead against the run of play just before halftime when Inzaghi got in the way of Andrea Pirlo's free kick to divert the ball past helpless keeper Pepe Reina. He added the second in the 82nd minute when he rounded Reina and squeezed the ball home under his body after being played in by Kaka. Dutchman Kuyt gave Liverpool some hope just before the end with a powerful header into the net after Daniel Agger had headed the ball across the area from a corner. But in the end it was Milan's fans celebrating loudest after seeing their 38-year-old captain Paulo Maldini lift the trophy. It was his record-equalling eighth final and the fifth European Cup success of his career. "The fifth is still beautiful," Maldini told SKY Italia television. "This would be a great end to my career but I want to play next season and then it would be very beautiful...to reach this point again next year." Despite Milan ending the match victorious, Liverpool enjoyed most of the possession and created more chances without managing to find the net earlier in the contest. Their disappointed captain Steven Gerrard told Sky television: "It's difficult to take but that's football for you. You've got to take it on the chin and move on and try and pick yourself up but it's heartbreaking." He added: "I thought we started well. We were in control just how we like to be but when you do that you've got to score. They got the first goal, with a bit of luck, but it was a big lift for them." Milan had failed to impress in the first half, and needed a stroke of luck to break the deadlock against the run of play. Their victory completed an astonishing comeback for the club punished for their role in last year's Italian match-fixing scandal and who were only allowed to compete in the Champions League after UEFA decided they had no legal grounds to ban them. Liverpool, who dominated large periods of the first half, maintained their tempo after the break in a determined and controlled attempt to grab an equaliser after falling behind. Apart from the ineffective Boudewijn Zenden, replaced after 59 minutes by Harry Kewell, Liverpool found ways through Milan's defense down the flanks and through the middle where Xabi Alonso had a fine game and should have equalised after 63 minutes. Gerrard seized on a wayward ball by Gennaro Gattuso, powered past some desperate defending but then hit his shot too close to Dida without enough power and the Brazilian saved comfortably down low to his left. Although Liverpool had more of the possession, Milan were content to soak up the pressure and grew in confidence as the game moved into its closing stages. The English side did finally breach the Milan defense late in the game but the Italians held on for a narrow victory and in the end it was striker Inzaghi who proved to be their hero. He justified coach Carlo Ancelotti's faith in picking him ahead of Alberto Gilardino and his joy was obvious, especially after injury had forced him out of the final two years ago. 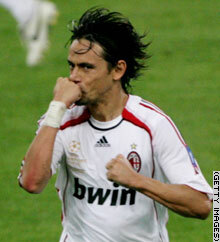 Inzaghi celebrates the first of his two goals to win the Champions League trophy.